Brined turkey breast is definitely the choice for my small family. But I heard that deep-fried turkey is also very good. Someone told me if I ever tried a deep-fried turkey, I won't switch back. 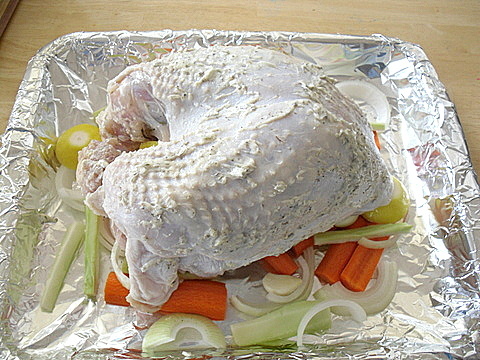 Since I don't have a deep-fryer for turkey, brine turkey is sufficient for me. 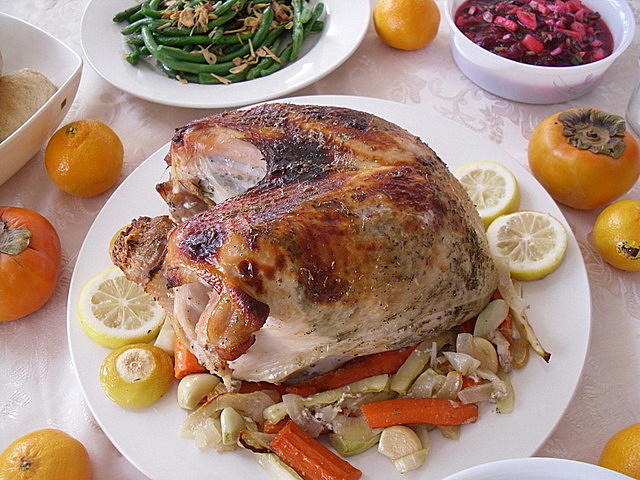 This turkey doesn't have the turkey smell at all, I am not sure whether it is because it only has white meat or because I added ginger into the brine and also lemon slices into the cavity before roasting? Anyway, since whatever I did this time worked, I will keep doing it. 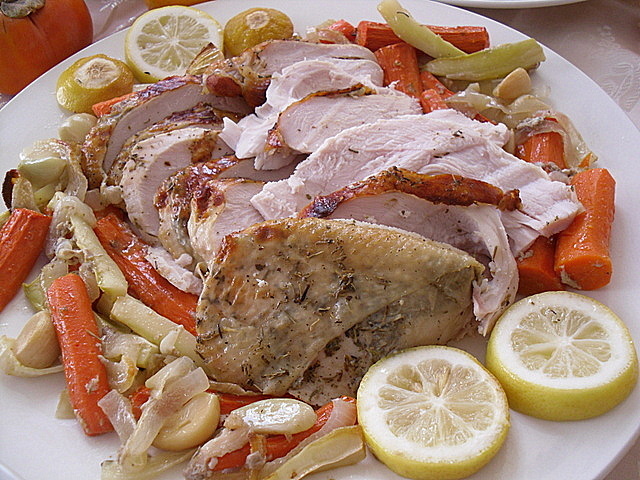 Moist and juicy carved turkey breast. This time I carved it the American way instead of the Asian way. Haha... You can see my Asian carving under Turkey posts. My brine: In a large saucepan, add 2 c. water, 3/4 c. kosher salt, 2 Tbsp. chicken granules, 1 Tbsp. black peppercorns, 4 slices of smashed ginger with skin, 1 Tbsp. dried rosemary, 1 Tbsp. dried sage and 3 Tbsp. honey. Boil the above until the salt dissolved. Set aside to cool. 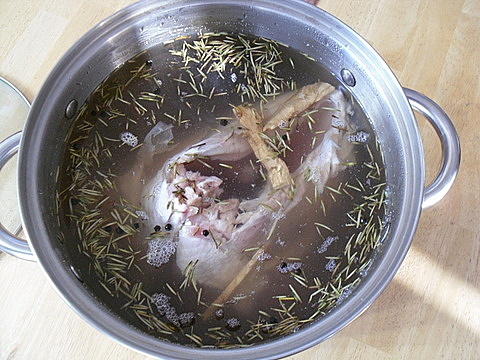 In a large stock pot, add in the turkey breast (about 5.3 lb), the cooled brine mix and top with cold water until it cover the turkey. Leave it overnight and a day in the fridge (32 hours or at least 24 hours). Rinse the turkey breast under running water. Then, place on top of a lined pan with some chopped out 1 onion, 3 carrots, 8 garlic cloves (keep whole), some celery (I used broccoli stems). Make butter rub: I used 3/4 stick of soften butter plus dried thyme, dried sage, rock salt and black pepper, mix well. Then, rub the inside and outside of the skin with it. Cut 1 lemon, put it in the cavity of the turkey. Bake at preheated 325'F oven for 1 hour 45 minutes. Then, increase it to 350'F and bake for 20 minutes more. Or until the internal temperature reaches 165'F (20 minutes/ lb of turkey). Rest for at least 20-30 minutes before carving. Moist and juicy, just the way I liked it! I'm a fan of dark meat, but brining makes this super juicy! oh, look juicy, must be full of flavours, yum! 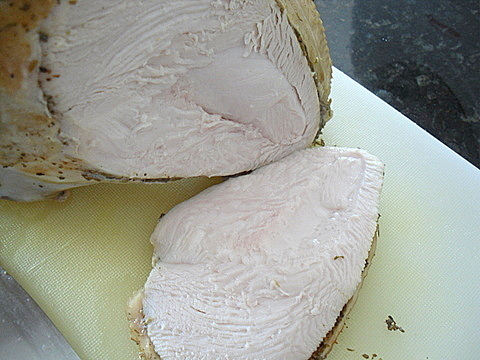 Wow, this turkey breast look great Ching...I never used this method...I will need to give this a try. Thanks for the post and have a great week!